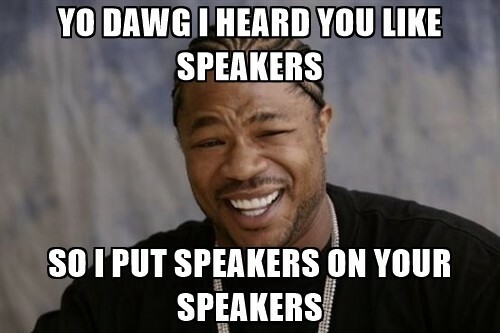 Design patterns that don’t make for the most fluid — let alone delightful — listener experience. Content curation strategies that don’t celebrate the richness of the catalog or the diversity of individual taste. 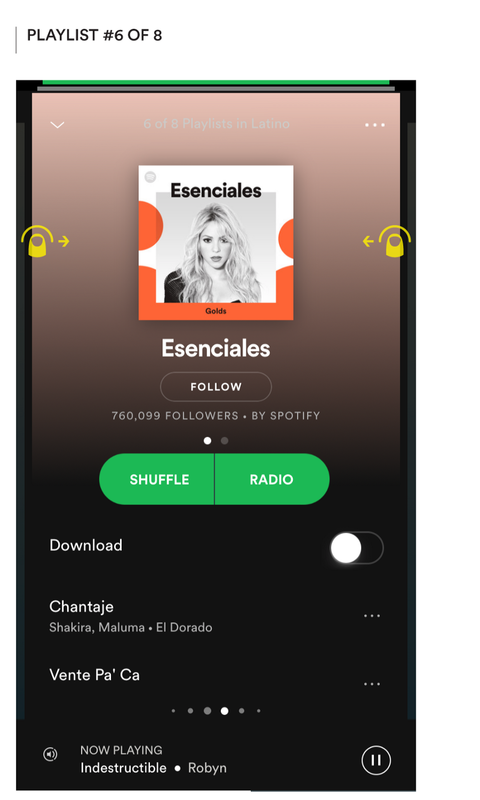 And an under-emphasis on features that would allow the listener to really explore the long-tail of the catalog and build affinity through personal narratives of discovery. A restructured content architecture that caters more intuitively to the listener’s varying dispositions with respect to familiarity vs. novelty of what they choose to listen to. 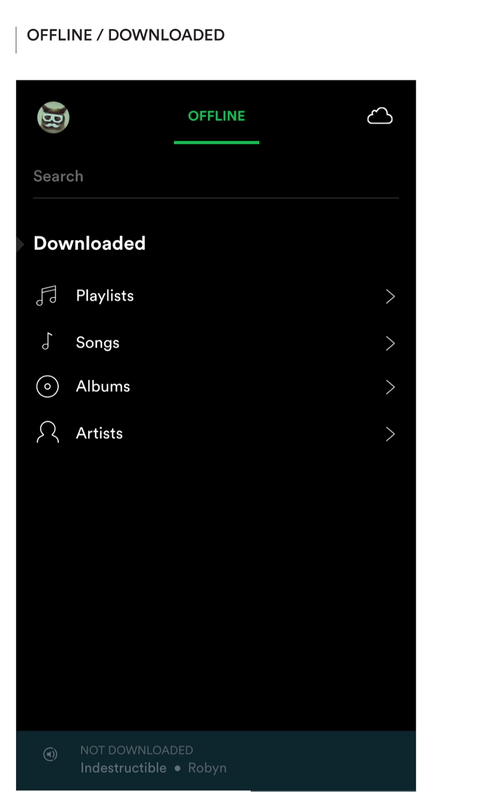 Better support for an Offline Mode to view and manage downloaded music. 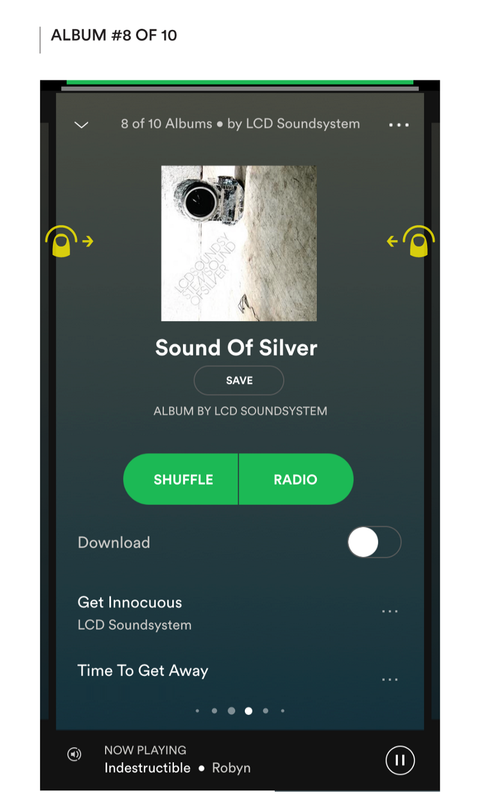 A Preview Mode in which any musical content being viewed is played automatically, making the actual music the driver of a set of informed skip/stay decisions to select what to listen to. 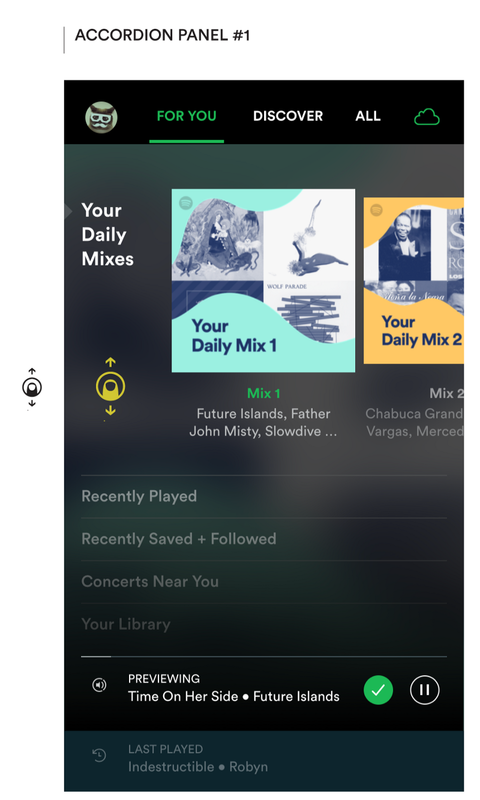 Adjustments to the UI to reduce friction in navigation across and up the catalog hierarchy, and between the screens supporting different modes of interaction — Browsing, Now Playing, and Up Next. 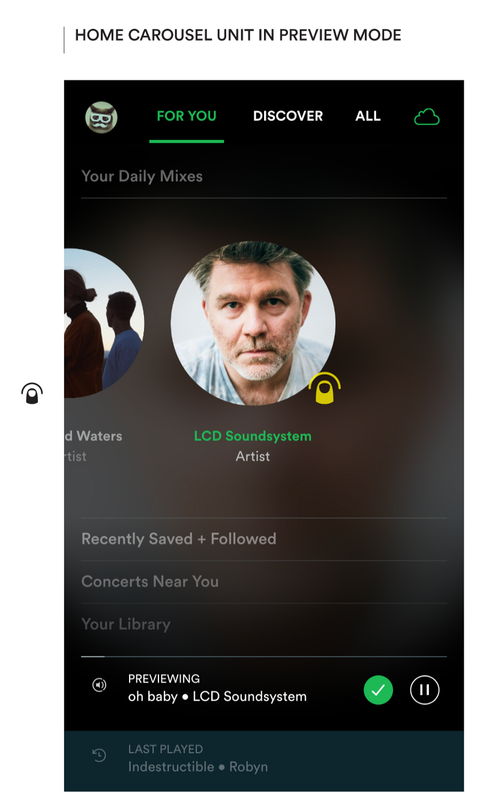 Better integration of Radio into the play options for any node where it’s applicable — playlists, songs, albums, artists and genres/moods. Like many of you, I’m a diehard Spotify listener. Absolutely in love with the way it opens up the world of music — and so also the world — for me. And like many of you, I see sooooooooo many ways in which it could be better. What follows is an exercise in applying my craft to explore some directions for enhancing the product experience — not just fixing what feels broken, but amplifying opportunities suggested by existing capabilities. In this round, I’ll tackle the following topics — Catalog Structure, Getting Started, Navigation, Radio (and barely touch on Social). Other topics will be addressed in subsequent rounds. 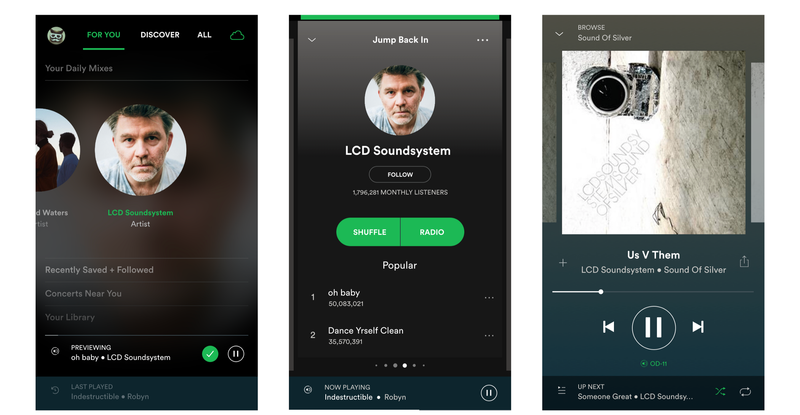 Speculative design such as this (and Spotify does attract its fair share) is typically driven by someone’s particular focus/passion/obsession on borrowed time, bounced off a few willing friends and if we’re lucky also some neutrals, but it is also bereft of the wisdom/inertia that comes with insider knowledge of technical capabilities, business opportunities, and sufficiently broad & deep data on users’ needs & desires. It both suffers and benefits from the limitations of its context. So I ask you to process this set of ideas as an exploration, not as a polished & thoroughly-validated proposition—that’s the work of a whole team of professionals equipped with a diverse set of skills and real data; much respect to them. This analysis and proposal take the iPhone experience as their area of focus; accounting for the full range of expressions across Android, the web, etc. would be a monumental undertaking. In addition, I have not dealt with secondary content such as Videos, Podcasts, etc. Again, it’s not about being comprehensive, as much as delineating a manageable scope in order to generate some constructive thought-starters within a reasonable timeframe. No, not really, but who can resist a good Pimp My Ride meme? As I offer this up as a stimulus for thought and discussion amongst those interested in the future of digital music and the craft of design, it would be disingenuous of me to not acknowledge the sheer chutzpah of even embarking on such a substantial exercise. If you take the time to read this, I have no doubt you will find much to quibble with—competing needs, inconsistencies, a need for greater clarity, etc. That’s great because that’s exactly how the sausage gets made — scratch, sketch, sweat, debate, repeat. All feedback is welcome. 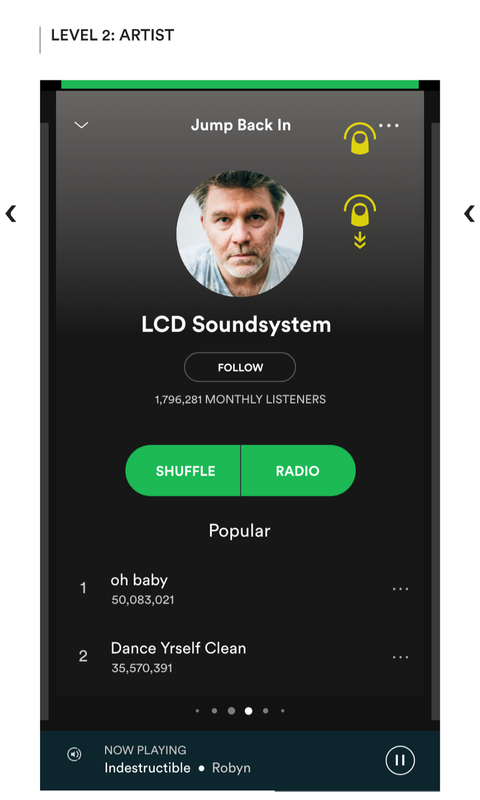 And of course, nothing would make me happier than seeing some of these ideas make their way into the Spotify experience, so if you’re interested, Call Me Baby. ASSESSMENT, Part 1: What We Love! This is not particular to Spotify, and as we’re well aware, there’s an ongoing battle amongst the various services and with the artists & record labels for access to content, but having acknowledged the thorny issues of rights and fair payment underlying that fight, let us not ignore just how f-ing magical it is to be able to access some significant fraction of the world’s recorded music almost anywhere, at anytime. How much longer we will continue to have access to a (near) complete catalog through any one service is an interesting question, but not one a listener has to face in the near term. Experientially similar to a playlist — someone/thing else is doing the work—Radio takes the concept of just picking a starting point & kicking back, and enables it across the whole catalog with a range of different scales of the input seed. 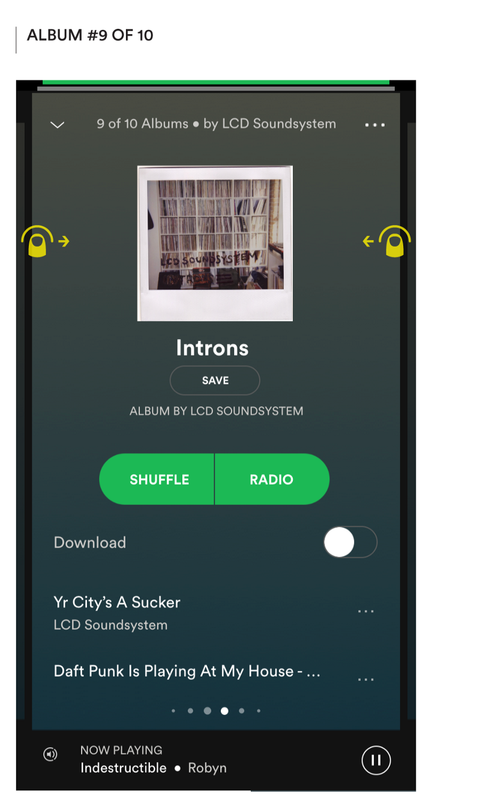 You can start a Radio station based on a song, an album, an artist, a genre, or a playlist (curated or user-generated). How crazy cool is that? What matters most here are the scale of the catalog and the quality of the data driving the generation of playlists; and to the victor go the spoils. Along with the other algorithmically-generated playlists (more on that shortly) Radio opens up the catalog for discovery in a way that requires only the barest effort from the listener to explore on a whim. 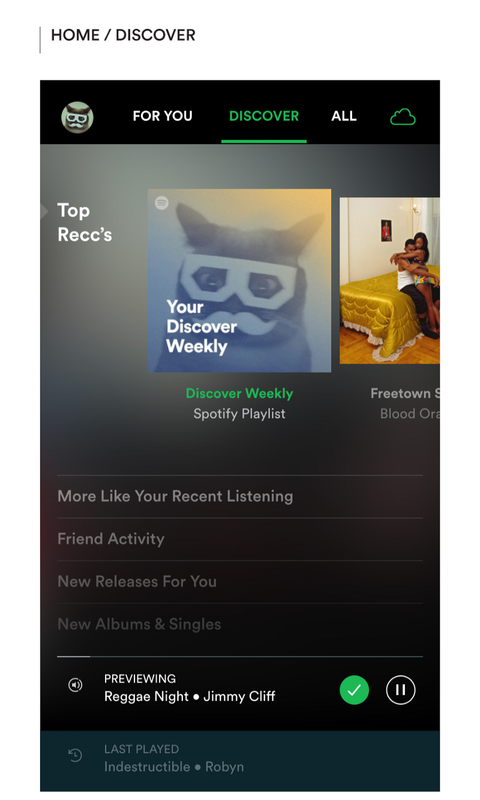 As the runaway success of Your Discover Weekly and Your Release Radar indicate, there’s a tangible difference between the uni-dimensional recommendations that pass for personalization on so many services and the real thing. Listeners can tell the difference, and they’re voting with their play buttons. 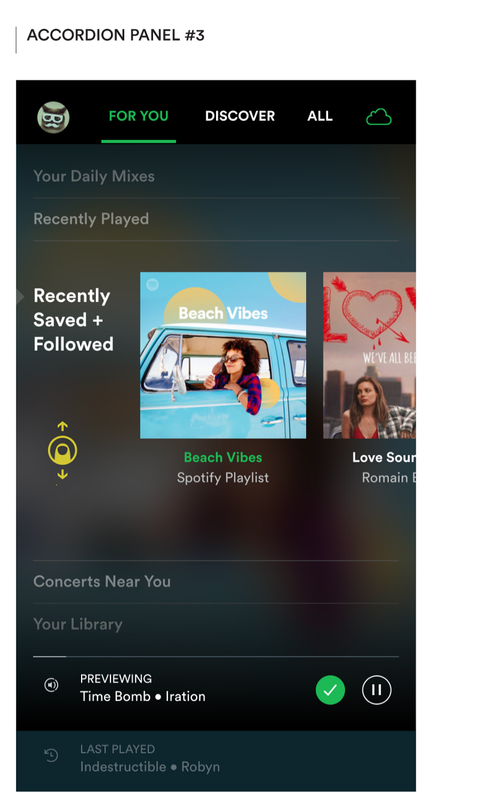 And with the Daily Mixes, Your Time Capsule, Fresh Finds, Your Top Songs 2017, and The Ones That Got Away, Spotify is clearly building on this in a big way. And it isn’t just in the realm of personalized experiences either. 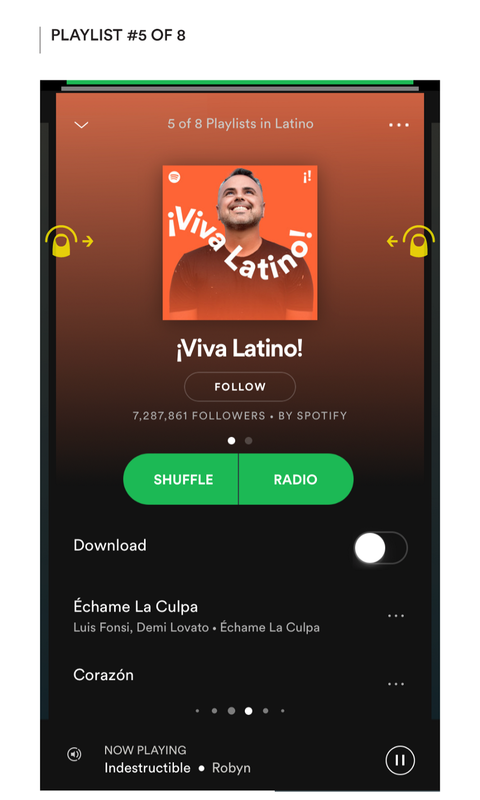 Sure we’ve got the easy top-line counts like Most Streamed 2017, Top Latin Tracks, The top playlists of 2017, etc. but where we see a glimpse of the future is the social intelligence currently being channeled into their marketing communications — ‘Take a page from the 3,445 people who streamed the “Boozy Brunch” playlist on a Wednesday this year.’ Now imagine what you could do within the product with some juicy cultural insight like that. Some of those playlists are so much fun! The sheer diversity catering to different genres & subs, moods, and modes of activity, etc. at a reasonably high level of quality on an ongoing basis is delightful. Kudos and more power to the devoted maniacs who scour the depths of the catalog and the scene to bring to light the gems they so carefully nurture. Real fan — always already has an opinion of your taste in music. But seriously, don’t we also just hate him because we only wish we knew as much as he does. And does he really have to be such a jerk about it? 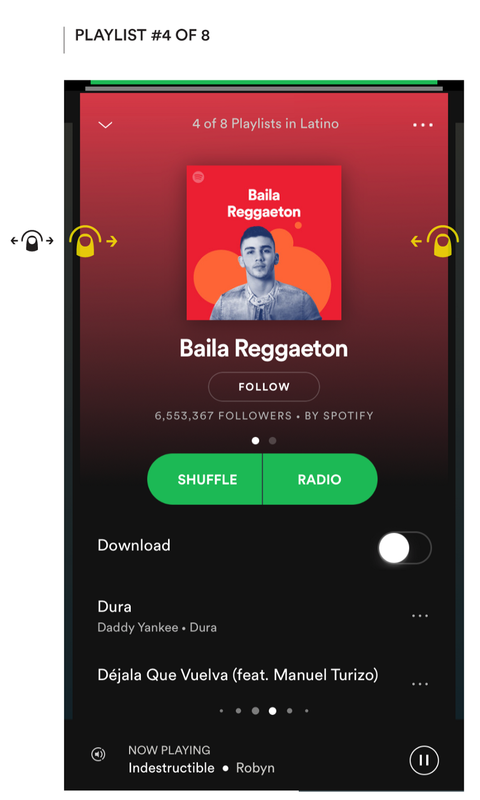 But love ’em or hate ’em, curated playlists also suffer from the same shortcomings as any market-driven merchandising mechanism in an age of power laws — the more popular they are, the bigger and more populist they get, and the more anodyne they feel to the ‘real fans’. Don’t get me wrong. I think that as a feature, machine-aided human curation is a great melding of the best capabilities of both worlds. This is not so much a problem with the machines as an argument with the way the humans are tuning them. The outsized presence of broadly inoffensive focus/workout/dinner playlists, atmospheric twinkly rainy day piano vibes, etc. that work so well for background music in offices, malls, bus stations, and hey! dinner with the fam, but do little to showcase fresh musical energy. The neutering of traditional genre categories with formulaic artwork that does nothing to help me anticipate what Ultimate Indie vs. New Indie Mix vs. Essential Indie vs. Indie Pop vs. Underground Hits vs. undercurrents, etc. might actually feel like. 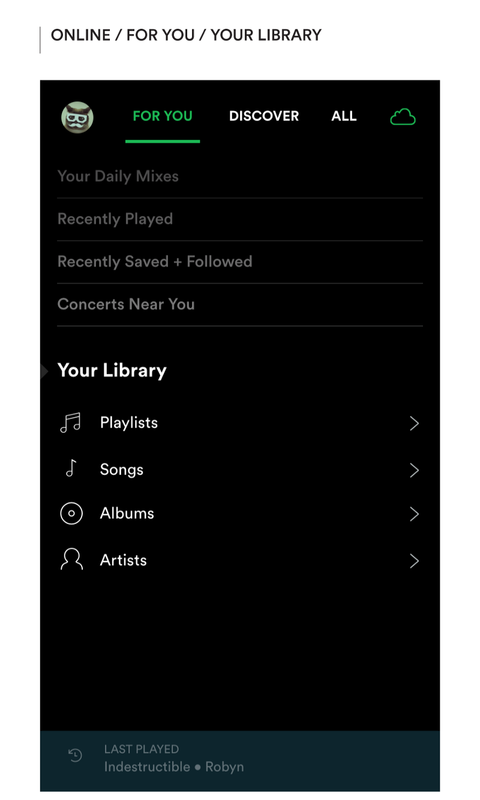 The limited number of personalized categories — usually Made For You, Recently Played, and More Like on the Home screen; the rest buried under Browse/Discover. Liz Pelly’s recent put-down of Spotify as some kind of Pez-dispenser of muzak for the lean-back generation is startling to say the least, but a wakeup call for anyone who cares about the state of the music industry. 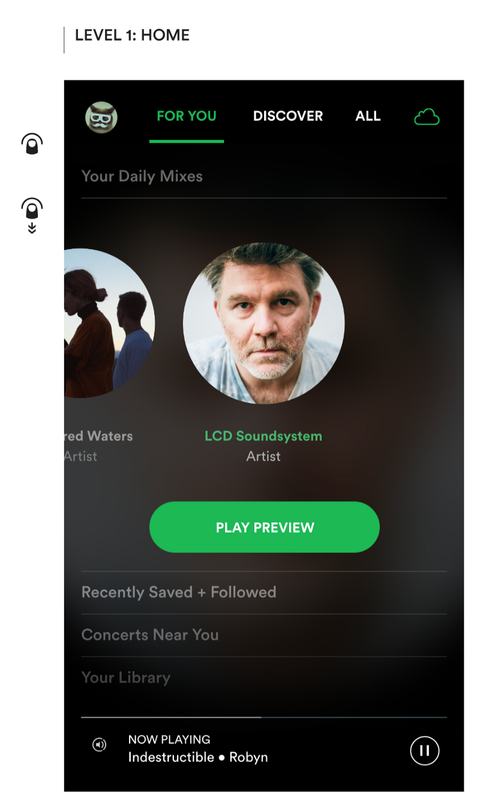 It’s a little difficult to understand the strategy behind the current presentation of the Home screen, but my best guess is that steering the listener towards this Vanilla-Land of a certain style of curated playlist — and away from the angles and edges that come with presenting more artists and albums — has everything to do with a desire to minimize any friction on the listener’s part in processing what is being presented, and easing their path into making a play decision. 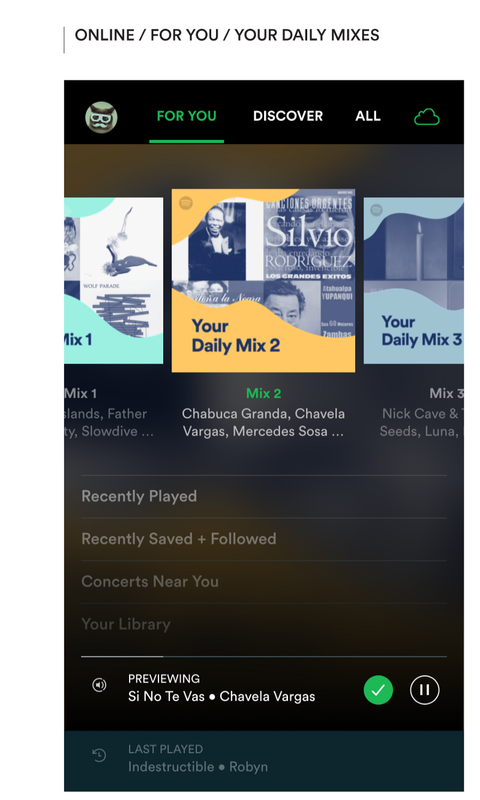 Curated playlists already promise to do so much of the work for us. Their calm and digestible thematically-driven visuals seek to drive home that promise further — now you don’t even have to process a row of disparate visually-dense album artwork in order to project which one might suit the mood best. To one crabby music-lover, this populist homogenization feels like the growth hypothesis of an Enya-lover. It may work well as an introductory experience for newly-acquired users, but it is quickly exposed for the uni-dimensional play that it is, and IMO does little to aid retention. Whatever the reasoning, it suggests a real lack of faith in the richness of taste of the music-loving public. As if they might be happy to be diverted into consuming vast quantities of wannabe-Music for Airports to the exclusion of their own preferences. 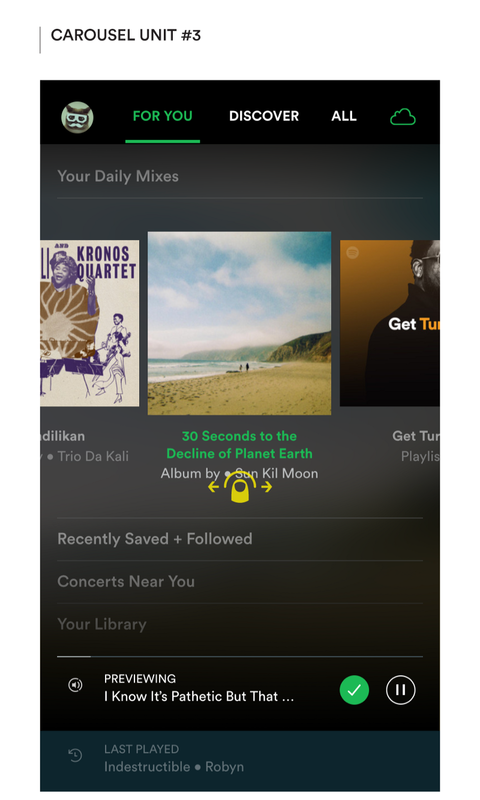 Strangely enough, this has been occurring at the same time that Spotify has been ramping up its game around algorithmic personalization. It’s almost as if we have two opposing conceptions of the listener living side-by-side! The obvious places to start fixing these issues would be (1) a shift in the editorial approach to the Home screen to make it more personally relevant and more reflective of the range of the catalog; (2) instituting mechanisms to compensate for the major labels’ outsized influence on playlists and the you-scratch-my-back-style relationships driving the inputs into the system; and (3) a recalibration of the heavy corporate prioritization of near-term growth which leads to a plethora of unfortunate downstream choices to prioritize smoothness, ease & traction, over voice, grit & personality. But I would also argue that a change in the approach to curation by itself is only a partial solution. The elevation of curated playlists as the primary mechanism to drive discovery in the Spotify universe — almost to the exclusion of all others — reads as a fatal-but-tempting-and-all-too-common misunderstanding of the role (and power) of a top-down editorial voice in a mega-catalog-on-demand, peer-to-peer, digital media world. Any successful retailer will tell you that curation is one of the big bats of merchandising. It’s the way you draw the customers back in with novel narratives that play into habits and trends around day-part, day of the week, seasonality, current events, etc. But also that merchandising is the layer on top, not the inventory itself. And as much as we all want to be tapped into the freshest expression of the global zeitgeist, our taste in music is intimately tied to our individual personalities and our tribal identities. We want to be intrigued by that stunning ensemble draped on the mannequin in the window, but heaven forbid they make it difficult to browse the racks to find our own take on the outfit. 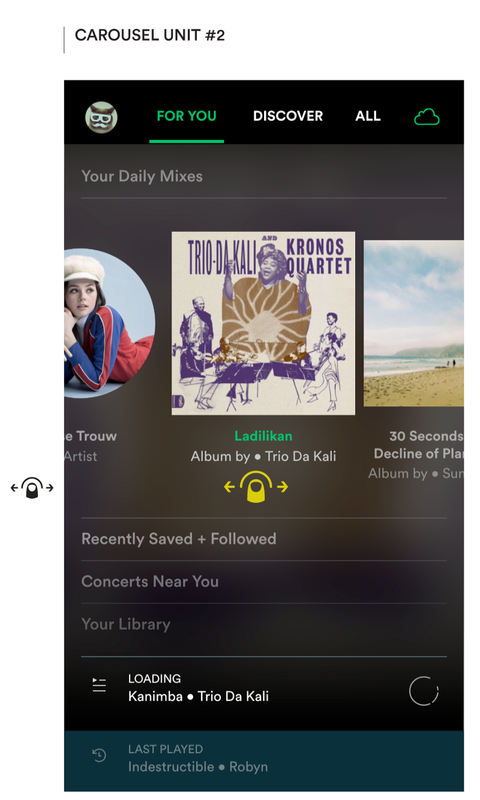 Discovery, of a listener’s own accord — through both active exploration and passive reception through their network and their algorithmically-personalized playlists — is what builds affinity to the depth and richness of the catalog. If we’re not activating the long tail and celebrating individual choice, we may as well be back in the stultifying hit factory of Casey Kasem’s Top 40. Some of the proposals in the following section will also address this opportunity to put the listener back in the driver’s seat. 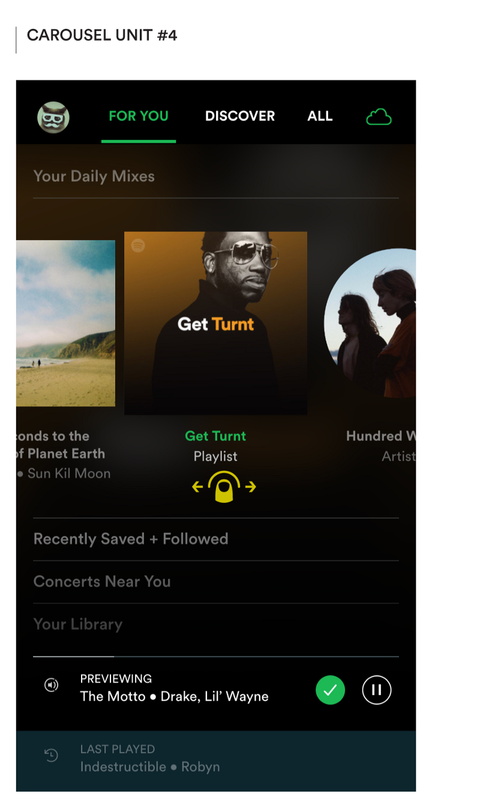 Kvetch: Like any mature platform in this age of category-killers, Spotify has the enviable problem of having developed a lot of features to cater to many different needs & desires. But there’s just too much of it! Aaaaargh! A little bit of something for everybody, but repeated everywhere, and scattered all over the place. (Kinda like a vicious cycle of suburban sprawl — commercial & residential footprints super-sized by automobile access requirements, thereby spreading out people & services over a greater area, requiring wider roads to facilitate access and greater distances between conurbations, and so more instances of the same services to support an equivalent population. Sorry, I digress!) It’s sprawling; it feels like it takes effort to get from A to B. And it’s incoherent, making it difficult to predict or even remember where to look for something. Between different dimensions of popularity, genres & moods, suggestions based on my listening habits, input from friends, etc. there are a ton of great content ideas there. All of them interesting to varying degrees to different people. But after years of accrual and sedimentation, the current structure suffers from gotta-also-have-it-there duplication, missed opportunities for rationalization & consolidation, and an unnecessary depth that buries some of the most promising material (hello Discover, where are you?). Browse could be rationalized and integrated with Home. Discover being buried under Browse is the biggest lost opportunity to leverage the power of data to increase the listener’s exposure to music they don’t yet know but could love. Upgrade now please! Search hangs out at the top level, but applies only to online content (try it in flight mode). Oh, you can also filter the various segments of Your Library as a proxy for offline search, but really? I’m not saying that a consolidated presentation of search results across multiple datasets is easy, but c’mon it’s 2018! Radio is just a different way of listening, not a doppelganger of the catalog. Better to allow the user to browse a single hierarchy, and then select the way they want to listen. A fix: One (there could be many others) listener-centric way of re-organizing all this content could focus on the listener’s different modes of consumption with respect to their existing music awareness/knowledge — sometimes we want something we know and love, sometimes we want to discover something new, and sometimes we just want to catch up with the world. In this model, content known to the listener which directly reflects their activity is grouped under For You. Discover, which extrapolates from that activity to surface music the listener may not yet know, is elevated to the top level. And All presents more general ways of listening based on activity across a larger population. Of course, for a new listener, the All tab would be the most logical starting point (Discover would be limited to New Albums & Singles, and For You would just be Concerts Near You). As they built up a history, more sections would open up. This aspect of the proposal is for the most part an exercise in rationalization of the hierarchy, with some improvements to the UI for browsing bi-level groupings, such as More Like Your Recent Listening and Friend Activity. Unaccounted for in the current structure — but crucial to supporting offline use — is an easy way to switch between views of the whole catalog and my downloaded music. Ignoring this need leaves a big hole for Spotify around travel and adventure—flying, hiking, road trips off the beaten path, etc. — i.e., precisely the kinds of experiences where music can really strike a chord. Amazon has already solved this really well with the Kindle which has a top-level toggle between All and Downloaded, making it a breeze to provision for, and then access my reading in flight mode. With all that fantastic content to wade through, we’re often left facing the paradox of choice. Sometimes it just feels impossible to make the right selection, because there’s always the possibility of a better option. This of course, is not particular to choosing what you want to listen to on Spotify. It’s the bottomless mimosa problem that plagues all large “content” consumption platforms — whether we’re talking about viewers endlessly squirreling away shows in their Netflix Watchlists, or the poor dating single’s maddening inability to focus on the cutie drinking a martini across from them right now (ahem!). When the supply is endless, the bubbles just don’t feel like champagne any more. I’m often left wishing for something that feels as immediate and tangible as the ‘dumb’ radio in my car. Actually hearing what the channel has to offer helps me make a split-second skip/stay decision as I flip my way through to find what works for right now. And somehow that seems to be the key—accepting the serendipity and joy of ‘right now’ over the imagined perfection of ‘the right one someday’. 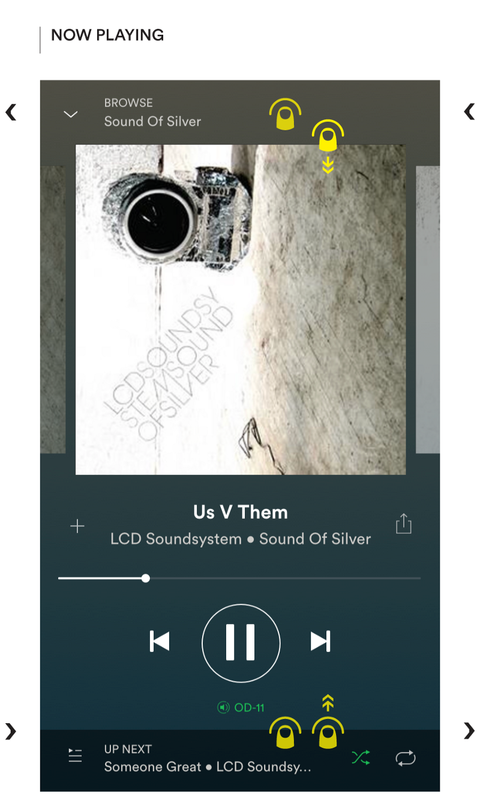 I propose a new way of browsing whereby we automatically start previewing the music in the node currently highlighted (this could be the default behavior of a user setting). This changes the browsing paradigm from scrolling to pagination, and so also the visual presentation of the browse grid. Within each tab, content carousels are laid out within accordion sections, which the listener can flip through. Swiping between the different options within each carousel changes the ‘station’. It promotes focus on the choice at hand, and the appeal of the music (or lack thereof) acts as the forcing function driving a simple yes/no choice, just like it does with that dumb radio, or old-skool TV, or the latest version of the Netflix TV experience. 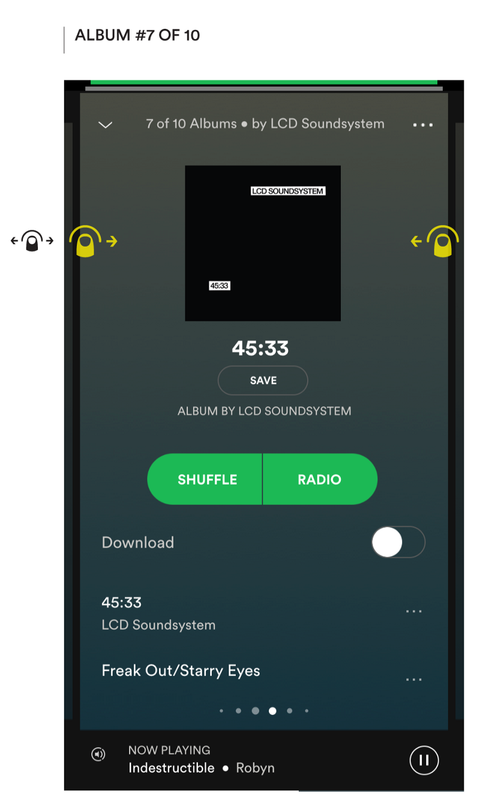 In this paradigm, when the listener chooses to play a new piece of music (album, artist, playlist, whatever)— either by starting the app or by browsing and selecting — the appropriate track would start playing in Preview Mode. 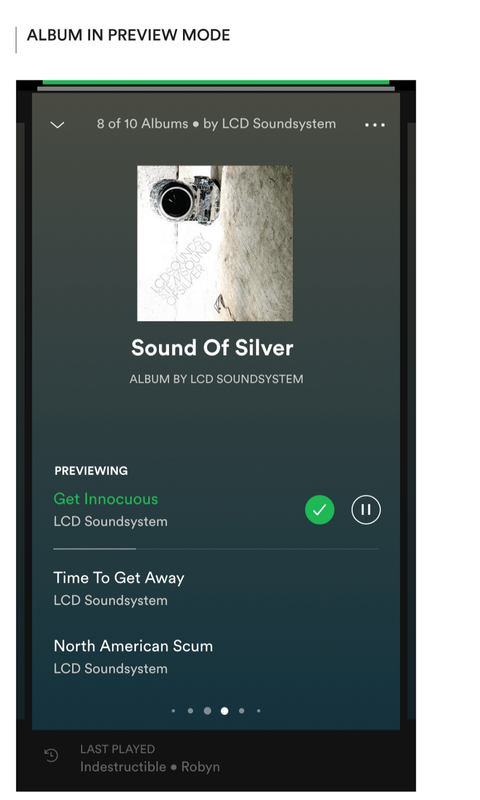 Once initiated, Preview Mode would allow for (1) single-action preview of other music as the listener browses through the catalog, and (2) access to the Last Played track through the bottom row should they wish to go back to what they were hearing. 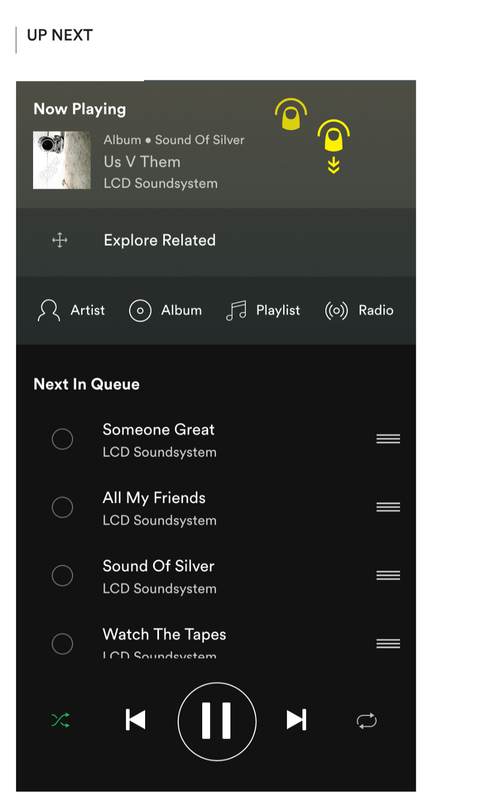 After a minute of playing in Preview Mode, the system state would switch to Playing, which would continue playing the currently selected music as they browse other options, and require them to explicitly choose to play (preview) any other music they wish to listen to. Extending this idea further, Preview Mode could be applied at any level within the hierarchy, e.g. 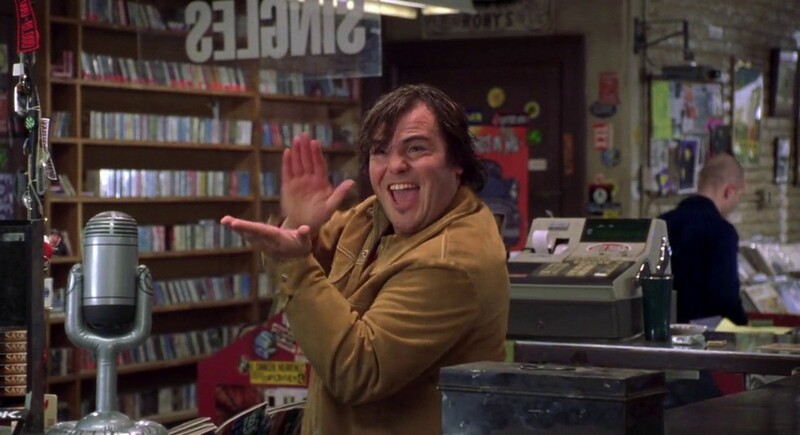 when the listener is viewing an artist, selecting between one of their albums, considering a genre, or picking between playlists in a genre, etc. 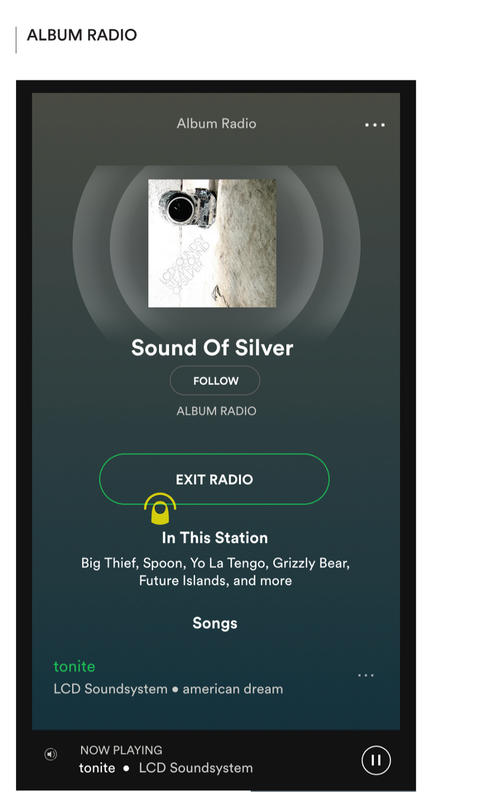 Cueing up the music to minimize any delay as the listener flips through stations could be a non-trivial challenge for the less predictable paths, and so the quality of the recommendations becomes even more important to keeping their experience smooth and delightful. In some ways all this may well feel like a lot of additional complexity in the design system to eliminate one extra click per musical unit while the listener is browsing. But if we’ve learnt anything from the success of Tinder, Snap et al, it should be that eliminating friction from browse mode is critical to delivering a more playful experience, and that play is the path to increased engagement. Supporting an easier way to preview would also suggest the opportunity to develop an easier way to browse the hierarchy. Lateral Movement, e.g. between albums by an artist, playlists in a genre, recommendations from my friends, etc. currently requires navigation back ‘up’ the tree to the parent node in order to go ‘down’ again. It never feels great because it’s just inherently inefficient. 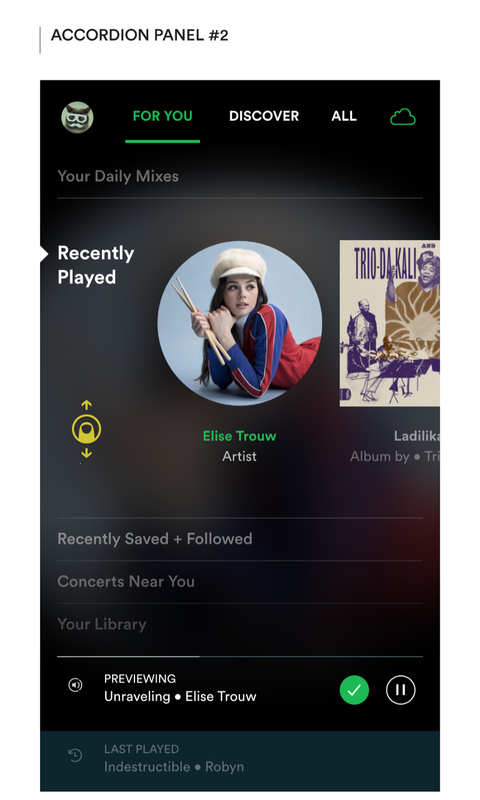 The lateral swipe capability is already enabled for switching between tracks on the Now Playing screen, where the horizontal axis is the obvious way to organize sibling nodes. The same gesture — from the edge of the screen — would work just as well when viewing any node in a list. By making the presentation of each node more card-like — with the current node delimited to a part of the screen, and room left for the presentation of other nodes around its periphery — we could also reinforce the concept of each content unit (song, album, artist, playlist, genre) being a node in the network, existing in some relationship — and thereby connected — to other nodes. Vertical Movement could be made more efficient too by using more of the top row as the tap area, and also allowing for the same via a strong downward flick when the screen has scrolled to the top (à la Inbox). And the Tab Bar? Ok, if you’ve had the patience to read this far, you probably have some questions regarding the decision to replace the standard iOS tab bar with Android-esque tabs across the top. 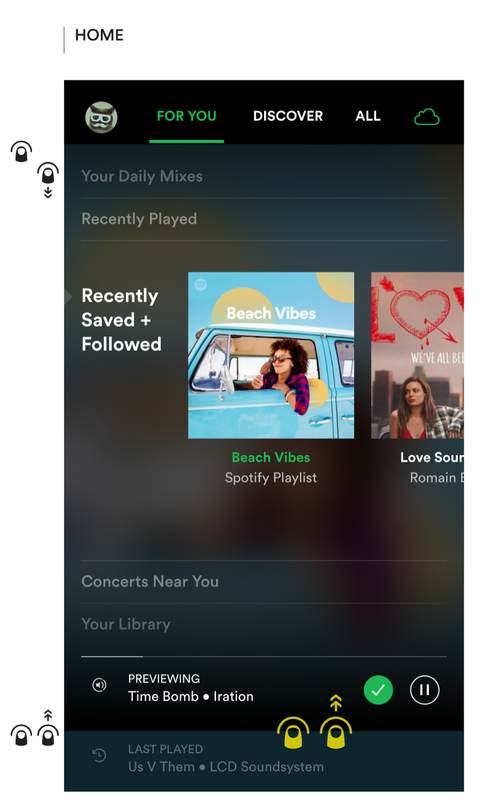 It was primarily driven by a desire to keep the bottom of the Home screen clear for a quick tap or swipe up and apply a consistent vertical swipe pattern to navigate between Browse, Now Playing, and Up Next. The efficiency of being able to select a tab with the thumb is easily replaced by a horizontal swipe gesture to navigate between the tabs. 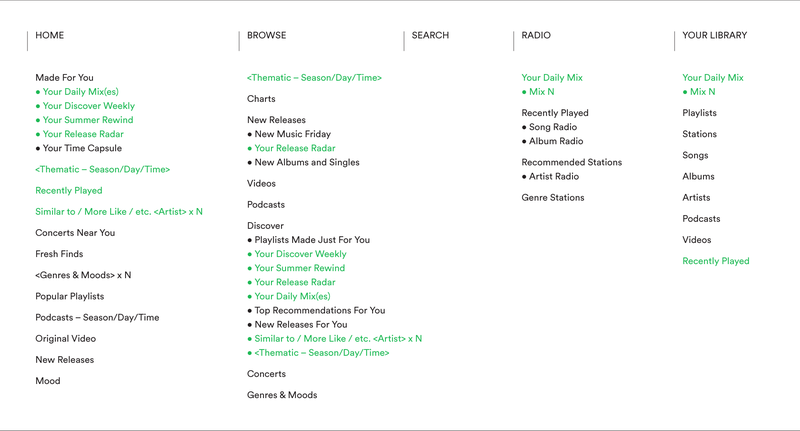 Radio is already available for every node type — playlists, songs, albums, artists and genres/moods — but presented explicitly only on genres. On the rest it is tucked away behind a ‘…’ (more) menu. I’ve already discussed the redundancy of having a parallel hierarchy in the current Radio section. Given its potential for loosening up the way that listeners relate to the catalog just as Shuffle Play did a few years ago (self-declared “Album Purists”, just let the hate flow through you!) I would argue that Radio would be better incorporated into the experience as an explicit listening option for every applicable node. 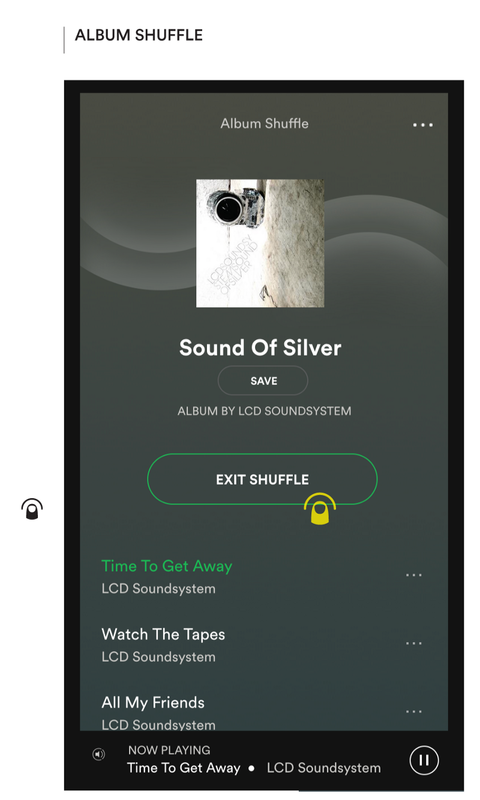 I propose that Radio and Shuffle are offered as paired play options within a split of the big green button. I am also acutely aware of the potential downside of the friction introduced by a more complex primary action, so a lot of exploration and testing would be needed to build confidence in a truly viable interface proposition for this. Music is a social experience — intimately tied to the definition and expression of our identity and the way we relate to people — and no one seems to be tapping into that; not really. 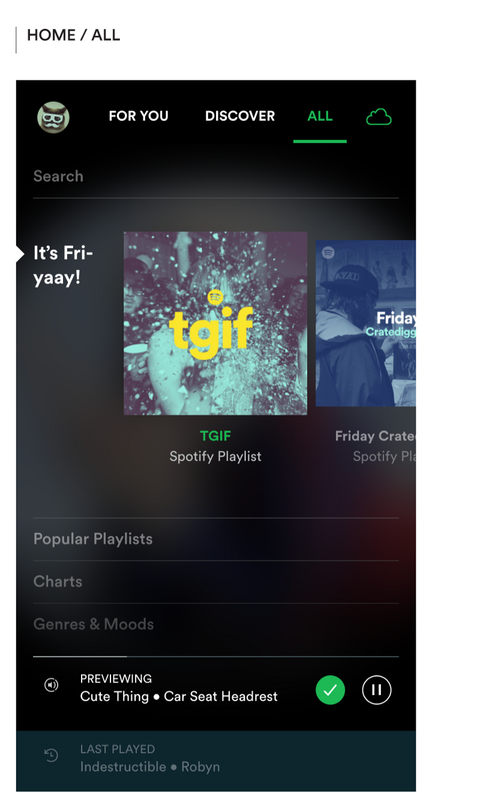 This topic is easily meaty enough to merit its own full-length investigation, so I will limit the exploration here to the aforementioned proposal to incorporate Friend Activity into the Discover tab using the same bi-level grouping UI as applied to More Like Your Recent Listening. It’s just a start. 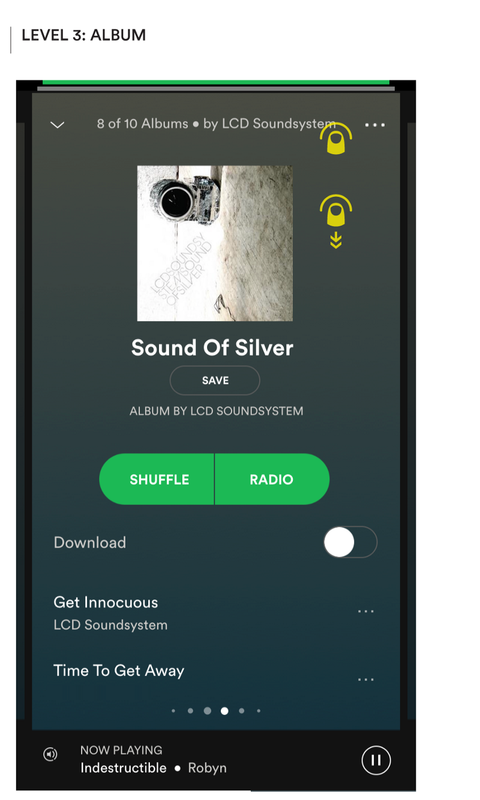 As Spotify rolls towards the next stage of its battle to remain the pre-eminent platform for the consumption of digital music (recent projections of Apple Music overtaking Spotify in paid subscriptions ought to light a fire), the primary competitive levers on the experiential side would appear to be (1) a simpler, more powerful & more listener-friendly experience, and (2) the power of discovery to drive listener engagement and affinity. 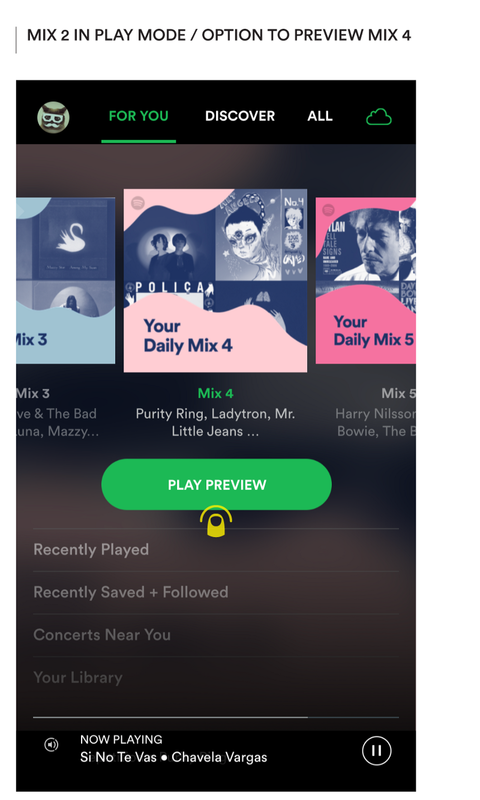 Between the weekly personalized playlists, Daily Mixes, More Like, curated playlists, Radio, Friend Activity, etc., I think that Spotify already has in play the core feature components necessary to own discovery. What’s been missing is a consolidation of these capabilities into a clearly articulated listener-facing concept that ties it all together, and a more coherent presentation of that concept in a way that maximizes the manifestation of those capabilities. 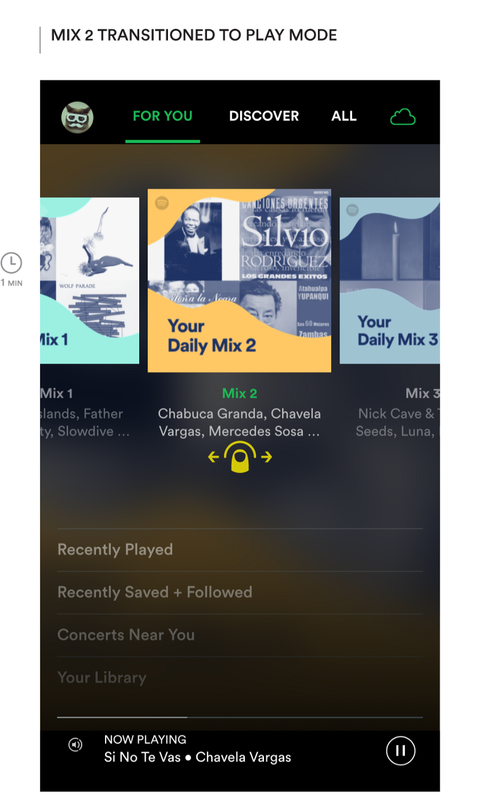 This first set of proposals has been oriented around redesigning the experience to make it easier for listeners to explore the catalog, to discover music they may not yet know, and to start listening. Future episodes will tackle other pieces of the puzzle, as outlined below. 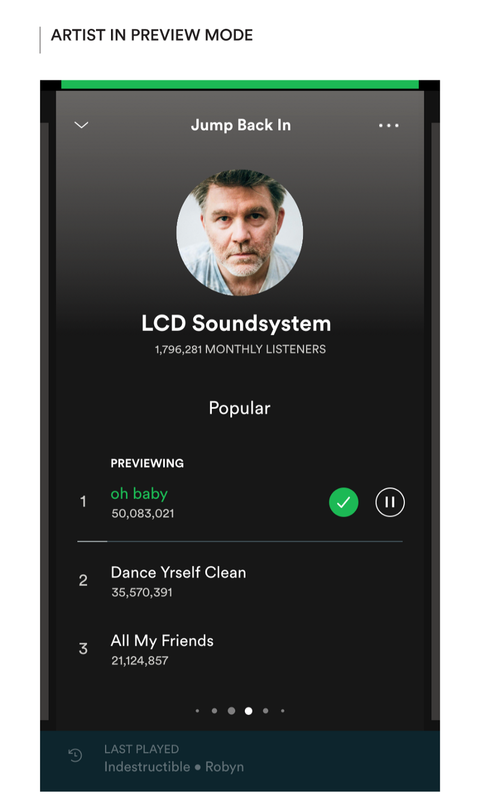 I want to see Spotify take ownership of the idea of being the premiere platform for exploring and discovering music. And I want it to be a no-brainer for every music-lover out there to find their next shower sing-along through it. Could Auto-Play Similar or Boil the Frog be the “Uber Pool (yes, cringe!) of music” ? Following, hearting, saving, and downloading. Why so confusing? Integrating Genius, WhoSampled, Wikipedia, etc. Much thanks to Sarah Linford, Sonja Kramer, David Murphy, Viktor Engborg, and Melvin Hale for their feedback.